Instructor Note: Red font color or Gray highlights indicate text that appears in the instructor copy only. This is Part II of a two-part activity. Part I is Packet Tracer – Troubleshooting Challenge – Documenting the Network, which you should have completed earlier in the chapter. In Part II, you will use your troubleshooting skills and documentation from Part I to solve connectivity issues between PCs. Step 1: Retrieve network documentation. 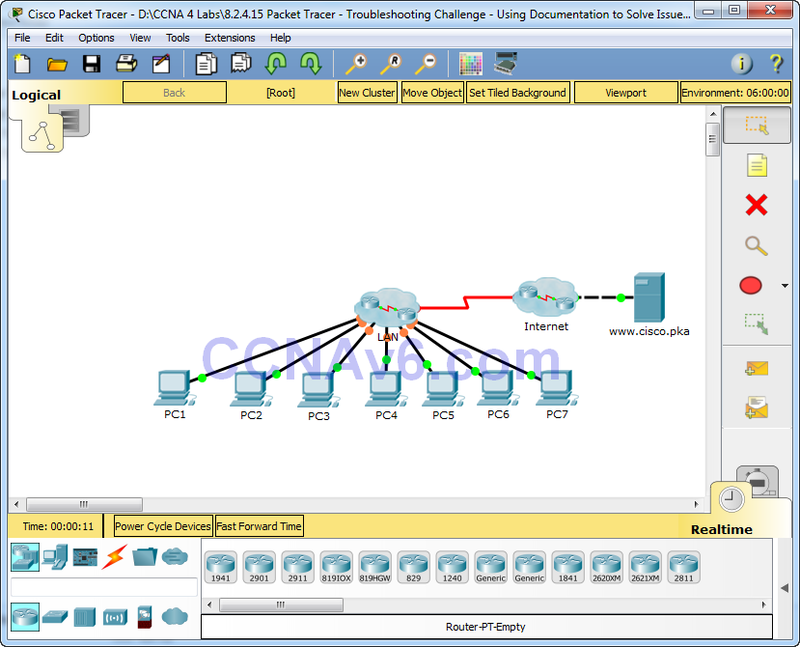 To successfully complete this activity, you will need your documentation for the Packet Tracer – Troubleshooting Challenge – Documenting the Network activity you completed previously in this chapter. Locate that documentation now. The documentation you completed in the previous activity should have an accurate topology and addressing table. If necessary, update your documentation to reflect an accurate representation of a correct answer from the Packet Tracer – Troubleshooting Challenge – Documenting the Network activity. You may need to consult with your instructor. Instructor Note: The student must have a complete and accurate picture of the answer network from the previous activity, Packet Tracer – Troubleshooting Challenge – Documenting the Network. You will need to either verify that the student’s previous work is correct or provide accurate documentation. Step 1: Determine location of connectivity failure. Step 2: What pings were successful? Document both the successful and failed pings. None of the PCs can ping the www.cisco.pka server. PC1, PC2, and PC3 can ping each other. PC4 and PC5 can ping each other. All PCs can ping their respective default gateways. Step 1: Choose a PC to begin gathering data. Choose any PC and begin gathering data by testing connectivity to the default gateway. You can also use traceroute to see where connectivity fails. Step 2: Telnet to the default gateway and continue gathering data. a. If the PC you chose does not have connectivity to its default gateway, choose another PC to approach the problem from a different direction. b. After you have established connectivity through a default gateway, the login password is cisco and the privileged EXEC mode password is class. Step 3: Use troubleshooting tools to verify the configuration. Step 4: Document network symptoms and possible solutions. As you discover symptoms of the PC connectivity issue, add them to your documentation. Instructor Note: The following is only one way the student might progress through this activity. The student can start from any PCs, except www.cisco.pka. For this sample answer, we started at PC4. Problem 1: From PC4, you can access the default gateway, R2. Telnet to R2 and verify the routing table. R2 only has directly connected routes, so verify the current interface configuration using the show protocols or show ip interface brief command. Careful examination of the IP addresses will reveal that the S0/0/0 address is incorrect. It should be 10.1.0.3 instead of 10.1.100.3. The show ip protocols command reveals no problems with the EIGRP configuration on R2. Solution 1: Configure the correct IP address for the S0/0/0 interface on R2. Problem 2: After EIGRP converges on R2, use the show ip route command to gather further information about possible problems. R2 has correct connected routes but only has two EIGRP routes. Missing routes include the four VLANs for R3, the R1 LAN, and the R4 LAN. Pinging R3 is successful, so telnet to R3. Because R2 is not receiving routes from R3, check the EIGRP configuration on R3 with the show ip protocols command. R3 is sending and receiving EIGRP updates and is advertising the correct network. However, automatic networks summarization is in effect. Therefore, R3 is only sending the classful 10.0.0.0/8 network in EIGRP periodic updates. Solution 2: Configure R3 with the no auto-summary command. Problem 3: Exit back to R3 and check the routing table. Routes are missing for the R1 and R4 LANs. Test connectivity to R1 and R4 by ping the serial interfaces for those routers. Pings to R1 fail but succeed to R4. Telnet to R4. On R4, display the routing table. R4 has no EIGRP routes, so use show ip protocols command to verify EIGRP routing. The command generates no output under the Routing for Networks section, so EIGRP is either not configured correctly. Use show run command to check the EIGRP commands. EIGRP is missing the network command. Solution 3: Configure R4 with the EIGRP command, network 10.0.0.0. Problem 4: After EIGRP converges, check the R4 routing table. The R1 LAN is still missing. Because the pings to R1 fail, access R1 from PC6. First, ping the default gateway address and then telnet into R1. Display the routing table. Notice that only the F0/0 network is in the routing table. Check the interface configuration with show ip interface brief command. The S0/0/0 interface is physically “up” but the data link layer is “down”. Investigate S0/0/0 with the show interface command. The encapsulation is set to PPP instead of Frame Relay. Solution 4: Change the S0/0/0 interface encapsulation on R1 from PPP to Frame Relay with the encapsulation frame-relay command. All PCs should now be able to ping each other. Problem 5: PCs still cannot ping the www.cisco.pka server. From any device, test connectivity and then telnet to R5. Investigate the interface status with the show ip interface brief command. The S0/0/1 interface is administratively down. Solution 5: Activate the S0/0/1 interface on R5 with the no shutdown command. Problem 6: PCs still can’t ping the www.cisco.pka server. However, PCs can ping the DNS server. 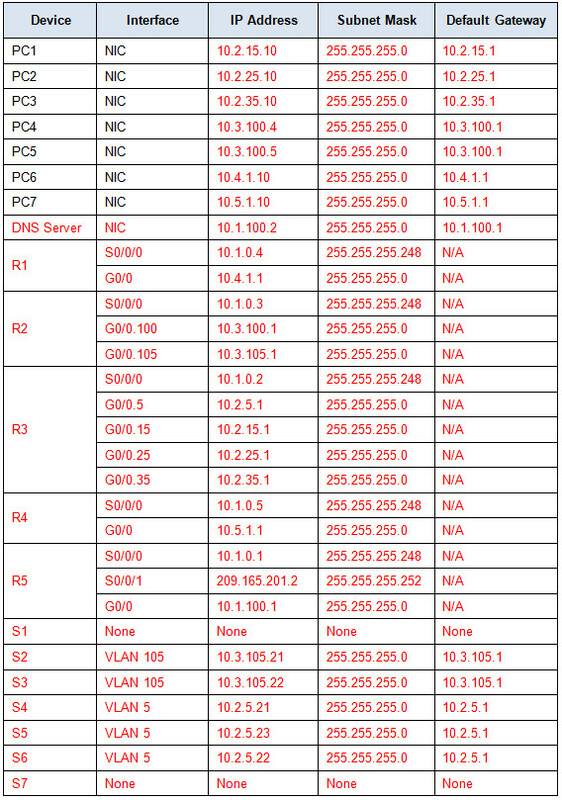 The problem is either with the R5 configuration or the ISP configuration. Because you do not have access to the ISP router, check the configuration on R5. The show run command reveals that R5 is using NAT. The configuration is missing the NAT statement that binds the NAT pool to the access list. Solution 6: Configure R5 with the ip nat inside source list 1 pool LAN overload command. Step 5: Make changes based on your solutions from the previous step. Step 1: Test PC connectivity. a. All PCs should now be able to ping each other and the www.cisco.pka server. If you changed any IP configurations, create new pings because the prior pings use the old IP address. b. If there are still connectivity issues between PCs or PC to server, return to Part 3 and continue troubleshooting. Your Packet Tracer score should be 70/70. If not, return to Part 2 and continue to troubleshoot and implement your suggested solutions. You will not be able to click Check Results and see which required components are not yet completed.